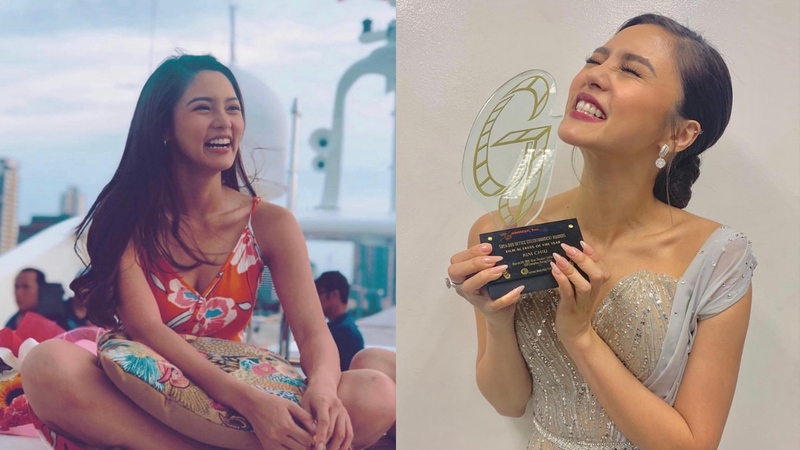 Kim Chiu just received yet another award: the Film Actress Of The Year award. This time, the award was given by the Guillermo Mendoza Memorial Scholarship Foundation (GMMSF) or more commonly known as the GMMSF Box Office Entertainment Awards body. Kim received the award for her performance in film, particularly for her role on One Great Love. One Great Love is a Regal Films production directed by Eric Quizon. It tells the story of a girl Zyra (Kim) who is caught in a love triangle between a man from her past and a man who can promise her a stable future. Kim’s leading men in the movie also won GMMSF Box Office Entertainment Awards: Dennis Trillo won Film Actor Of The Year, while JC De Vera won Movie Supporting Actor Of The Year. The GMMSF honors stars and performers simply for their popularity and commercial success in the Philippine entertainment industry. The GMMSF board of jurors deliberate on the year's winners, which are chosen from the top 10 Philippine films of the past year, top-rating shows in Philippine television, top recording awards received by singers, and top gross receipts of concerts and performances. From all these various top works of art, the GMMSF hails the best of the lot. Recently, Kim seems to be doing well for herself. Just last week, we reported that the actress bagged a Best Actress Award from the Guild of Educators, Mentors, and Students (GEMS) for her role on “Mata,” an episode on Maalaala Mo Kaya (MMK). Now, she has this movie award to add to her growing list of accolades. Kim says that those were lessons imparted to her by her mom. She reminisced even more about her mother and felt like she was ever-present and saying, “‘Kim, good job!’ She may not be here beside me, but I know she is up there looking after me. I hope I made her proud.” Sniff. We’re pretty sure her mom is beaming. On our end, we’re feeling like a Kim Chiu marathon. Who’s game?